Soon will not be very soon for many when it comes to expanded text ads recently announced by the Google; after all the text limit of ads is going to double. If you are curious, this blog is all about the Expanded Text Ads of which you can benefit from by focussing on what matters. Expanded Text Ads- What are these? Twice lengthier than current text ads, these will have two headlines with a space to-envy-from for description. And they are mobile-friendly too due to the increasing mobile usage. As with being responsive, these will fit themselves in all the devices. What prompted Google to make this change? According to Google, the change made to text ads is biggest since the launch of Adwords15 years ago.The change is prompted by thinking about the ads in context of mobile devices and how the advertisers can get the most of them. This thought germinated from the fact that more than half of the search queries Google get are received from mobile devices. 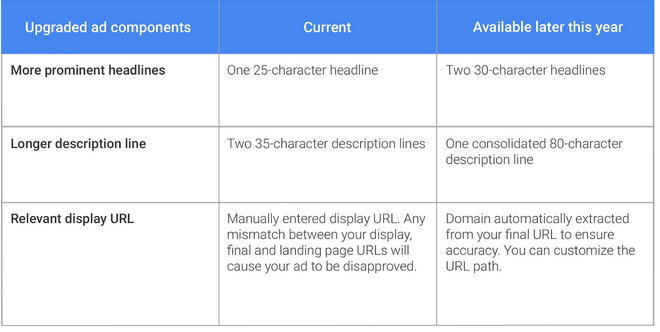 Google earlier in February eliminated right-side ads, which eliminated the restriction of limits and character. What do the new Expanded Text Ads look like? 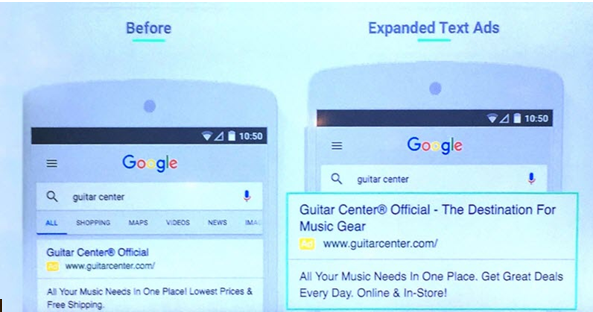 Below given image shows the difference between the ads as displayed before and after the implementation of expanded ad text in both the mobile and desktop platforms. How much ‘expanded’ these expanded ads are? As told above, almost 2x more characters in AdWords text ads, you have a total of 140 characters with which to create the ad copy. The move seems to go on Twitter’s model of tweets but Twitter hasn’t commented yet.Your task now is to make the move made by the Google work in your favour by using the space and characters drive the performance of ad for you through enticing ad copies with great headlines and ad description. How much more space in the expanded headlines? Shunning the 25-character headlinethat is currently available for text, now Advertisers will be able to take benefit of two 30-character headlines in the new format. How much characters will be in the descriptions? With the expanded ad format, now description will have 80-character space in one line, which is limited to two description linesof 35 characters. 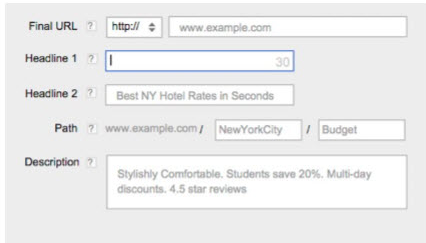 What’s new about the display URLs? The days of manual addition of URL will go away with the new ad format; domain will be extracted automatically from the final URL.To better the display URL performance, advertisers can add up to two paths. Is CTR expected to get better? The increased space and number of characters will give the ads more visibility, which is counted on to increase CTR by around 20%.It has been observed that using ad or call extensions are seen to increase CTR by 12% in the mobile text ads. You can thus count on increasing the number of clicks with the increase in the number of characters. 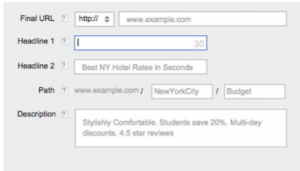 What preparation you need for Expanded Text Ads? Quality Scores are already very important to the advertisers but this is only going to get more significant with the new ad format. On mobile devices, below the rank of 2 to 3 becomes irrelevant due to smaller screen size. Get geared up for more optimization in the ad text. 10. When will the new ads come out? No date has been give officially by the Google yet. It is suggested to keep an open eye for it.